Hours may vary during election cycles. The Elections Administration Office will be closed on Friday, April 5, 2019 for Administrative Leave and on Friday, April 19th in observance of the Easter Holiday. 107 S. St. Mary's St.
May 4, 2019 Election will include City Council Wards 1 and 5 and Beeville Water Supply District (WBEE). Only voters in these districts will be eligible to cast their vote. 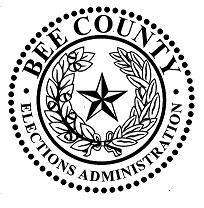 Bee County has been approved for Vote Centers for this election. Eligible Voters will be able to cast their ballot at any one of the four locations on Election Day. Early voting starts April 22nd at the Elections Administration Office. Absentee Ballot by Mail (ABBM) must be applied for annually. You may call our office at 361-621-1519 to request an application be mailed to you or click here for a printable application. Boleta de elector ausente por correo (ABBM) debe aplicarse para cada ano. Usted puede llamar a nuestra oficina al 361-621-1519 para solicitar una aplicación le enviará o haga clic en aquí para una aplicación imprimible. Effective December 1, 2017 if an ABBM is faxed or emailed or if an FPCA is faxed, then the applicant must submit the ORIGINAL application BY MAIL to the early voting clerk so that it is received no later than the 4th business day after receiving the original ABBM or FPCA. Complete this form and return to our office. Volunteer Deputy Registrars (VDR) are entrusted with the responsibility of officially registering voters in the State of Texas. They are appointed by county voter registrars with helping increase voter registration in the state. They administer voter registration applications and take responsibility for making sure the citizen completes the application correctly so there is no delay in processing. Bee County has adopted the Secretary of State Volunteer Deputy Registrar training.